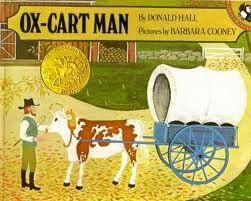 The "Ox-Cart Man" is not a flashy, fancy, or even funny book, but it is an enduring classic that every child should read (or have read to them) at least once, though in my experience, your child will definitely consider it worth a re-read. It is the story of a by-gone day and in a way a small history lesson: a great way to introduce kids to how people lived before cars and planes and amazon.com. At the beginning of the story the Ox-Cart Man fills his cart with everything his family has worked all year round to produce: garden grown potatoes, hand-knitted mittens, and feathers gathered from their geese; and starts off on a long journey to the large town of Portsmouth where he sells his goods (ad even his ox and cart) to buy presents and necessities to keep his family over the winter. . .when the whole process of making goods to sell begins again. I love how everyone in his family pitches in to make something for the trip. I love the glimpses this book provides of nearly lost arts, spinning wool into yarn, hand carving birch brooms, things no body really has to do any more. I love the beautifully done illustrations by the peerless Barbara Cooney. Coryn loves the pictures of the animals (though she always seemed a little concerned when the Ox-Cart Man leaves his Ox behind after selling him at market.). She asks endless questions about the pictures of sheep being sheered . . . and about tiny things not even related to the story like the little girl petting a cat in the foreground of one of the pictures. Her involvement, and the wheels turning in her head, make this book a definite addition to our re-check-out list.